Home » Concave vs. Convex: What’s the Difference? Scientific and technical writers face unique challenges that the everyday writer may not have to worry about. This type of writing often describes concepts that are very complex, difficult to convey in ordinary English, or both. Even in our day to day lives, we sometimes use words that might seem more at home in scientific literature or esoteric datasheets. For instance, are the lenses in your sunglasses convex or concave? What about zoom lens on your camera? What do these words even mean? In this article, I’ll compare concave vs. convex. I’ll use each in a sentence, and I’ll give you a helpful hint to aid you in choosing concave or convex for your writing. What does concave mean? Concave is an adjective that describes a surface that curves inward, or is thinner in the middle than on the edges. In ordinary usage, concave and convex are typically used when referring to glass surfaces, like the lenses of optical viewing equipment. The side mirror of a car has a concave surface. The inside surface of most eyeglasses is concave. The line on the graph represents a concave function. The word is still an adjective, and from a grammatical perspective, its usage doesn’t change. What does convex mean? Meanwhile, convex describes a surface that curves outward, or is thicker in the middle than on the edges. You can easily find examples of these surfaces in everyday life. The outside surface of an eyeglass lens is convex. So is the lens of a camera. Other examples include magnifying glasses and the lenses of telescopes. Of course, there is also a convex function in the world of mathematics. Like concave, its usage doesn’t change in this context. Once again, for an accurate explanation of concave and convex functions in mathematics, I encourage you to speak with a math tutor. 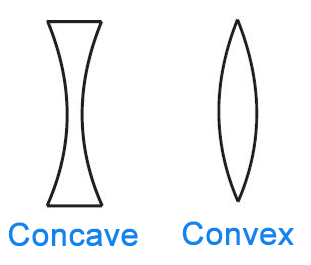 Still not sure you can remember convex vs. concave? There is actually an incredibly simple way to remember which type of surface is which. The word concave contains the word cave, and concave shapes and caves both go inward. Mnemonics don’t get much simpler than this one. Is it concave or convex? The words concave and convex describe the curvature of a surface. These words also find usages in mathematics, but a detailed description of mathematical concepts is outside the scope of this article. Concave and convex maintain their status as adjectives when used in this context. If you have trouble remembering whether a surface is convex or concave, there is an easy way to find out. A concave surface curves inward, like the mouth of a cave. This memory trick should help you decide whether to use convex or concave in your writing. 1 What is the Difference Between Concave and Convex? Allusion vs. Illusion: What’s the Difference? Mucus vs. Mucous: What’s the Difference?